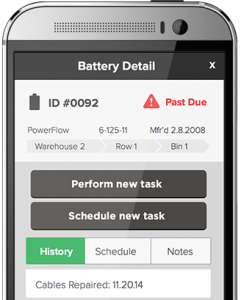 Organize your forklift battery care schedule with Battery Steward. alerts you to when a task is due or past due. Use your mobile device and identifying labels to create easy-to-follow battery care task lists. Check off batteries by scanning the Battery Steward identifying label that has been attached to your battery. Record and analyze important battery maintenance data through the online portal. Identify neglected, misused, or abused batteries. Download the app and create your account. Click here for a Quick Start Guide.